Uganda’s parliament has passed a law to impose a controversial tax on people using social media platforms. It imposes a 200 shilling [$0.05, £0.04] daily levy on people using internet messaging platforms like Facebook, WhatsApp, Viber and Twitter. 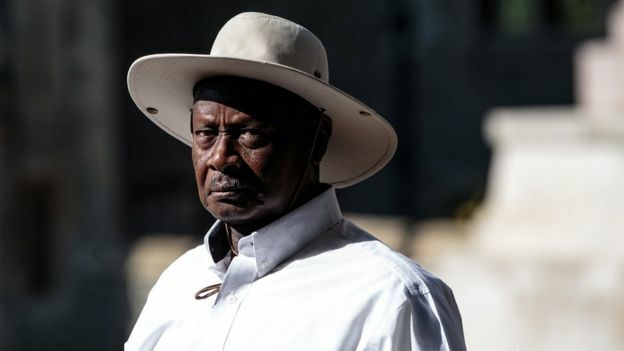 President Yoweri Museveni had pushed for the changes, arguing that social media encouraged gossip. The law should come into effect on 1 July but there remain doubts about how it will be implemented. The new Excise Duty (Amendment) Bill will also impose various other taxes, including a 1% levy on the total value of mobile money transactions – which civil society groups complain will affect poorer Ugandans who rarely use banking services. State Minister for Finance David Bahati told parliament that the tax increases were needed to help Uganda pay off its growing national debt. Experts and at least one major internet service provider have raised doubts about how a daily tax on social media will be implemented, the BBC’s Catherine Byaruhanga reports from Uganda. The government is struggling to ensure all mobile phone SIM cards are properly registered. And of the 23.6 million mobile phone subscribers in the country, only 17 million use the internet, Reuters reports. It is therefore not clear how authorities will be able to identify Ugandans accessing social media sites. Mr Museveni pushed for the social media law back in March. He wrote a letter to Finance Minister Matia Kasaija insisting that the revenue collected by the social media tax would help the country “cope with consequences of olugambo [gossiping]”. But he argued there should be no tax on internet data as it was useful for “educational, research or reference purposes”. Critics at the time said the law would curtail freedom of expression. Mr Kasaija dismissed concerns that the new law could limit people’s use of the internet. “We’re looking for money to maintain the security of the country and extend electricity so that you people can enjoy more social media, more often, more frequently,” he told Reuters in March. Social media have become an important political tool in Uganda for both the ruling party and the opposition, our correspondent says. Access to platforms was shut during presidential elections in 2016. President Museveni insisted at the time that it was done to “stop spreading lies”. Other East African countries are passing laws criticised by activists as affecting freedom of expression. Tanzania’s government won a court case on 29 May against opponents of new regulations requiring bloggers to pay a licence fee and disclose their financial backers. In Kenya, a new cybercrime law came into force on 30 May. Journalists and bloggers managed to win a court order blocking the Kenyan law’s ban on “false” information, which they argue is an attempt to muzzle independent media.